Recently, I came across this WSJ article about American made artisanal cheeses. It describes the growth in demand for and production of artisan cheese across the U.S. This article grabbed me because it included numbers on how many producers of artisan cheese there were across the country as well as individual states - something I've found pretty difficult to come by. Through my work, I know that dairies are looking at value-added dairy production as a possibly opportunity - for income growth, bringing the next generation back to the business, etc. - and this is supported by information from sources in the article. Goot Essa cheeses. 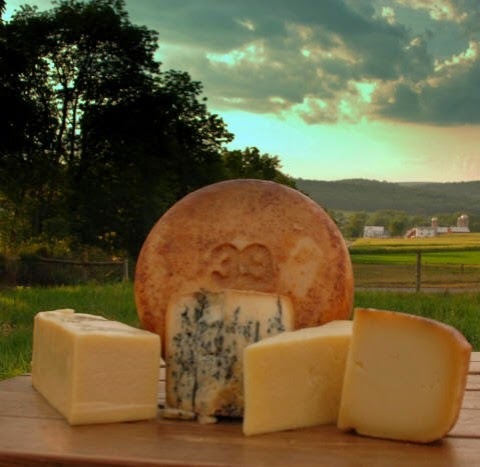 Goot Essa LLC is located in central PA.
Three of the factors Mr. Roberts viewed as driving the growth of the artisan cheese industry are: raw milk cheese production, women farmers, and goats. Indeed, as of July 2013, there were 55 permits for the manufacture of raw milk cheese aged 60+ days within Pennsylvania. This accounts for over half of the number of PA artisan cheese producers. Of those 55 raw milk cheese producers, 13 appear to be producing goats' milk cheese (I say "appear" due to my interpretation of the operation types given). Demand for local foods is also a driver behind the growth of the farmstead and artisan cheese industry. With no drop off in local food demand in sight, the future looks bright for enterprising dairies. However, along with the increased demand and resulting supply (with the increased number of cheese makers), comes an increased environment of competition. Artisan cheese makers must provide not only a local product, but it must be of high quality and be a product of a sound business plan. For individuals interested in entering the cheese industry, Penn State offers a 4-day short course for farmstead and artisan dairy processors and others interested in cheese to gain knowledge of the materials and processes used to make specialty cheese and learn techniques to improve their business.